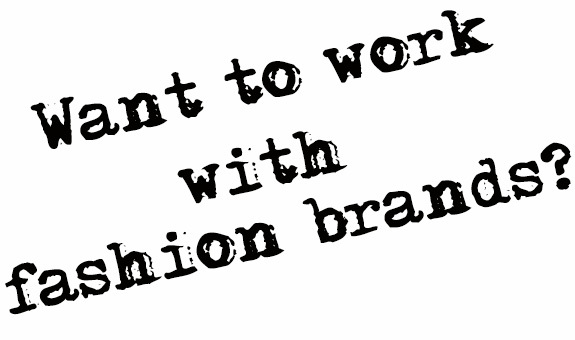 Guest Post: How Can Fashion Bloggers Work with Clothing Brands? It can be hard to find your footing in the fashion blog world. In a digital era where every fashionista with an internet connection seems to want to become the next Tavi Gevinson, Man Repeller, or Sartorialist, making a name for yourself is no mean feat. Before contacting your favourite brand, and especially if your blog is in its early stages, show that you’re on the same page by featuring them anyway. Find something that you love, whether it’s one amazing piece or an entire collection, and post it, upload it, Tweet it, Pin it. The best collaborations come from being honest, and this step gives you the bonus chance to see which clothing brands really are the perfect fit to your personal style, and that of your blog. Don’t forget to tag! More and more clothing brands understand the power of fashion blog collaboration. A genuine testimonial from a trusted source – read: you and your blog – is more valuable to a clothing brand than standard advertising, because it’s organic. If you think we’re overstating this point, consider whether you’d be more likely to want a particular outfit after seeing it in a catalogue or an online ad, or featured on a favourite blog. This can absolutely work in your favour if you let it, with brands such as Stylekeepers actively inviting alliances by offering store credit in exchange for fashion stories featuring their product. As we’ve mentioned, collaborations go both ways, and there are plenty of opportunities out there if you scout around for them. This can be especially true of online-based brands, which are more likely to promote themselves online as well. Work out how you’re going to sell yourself to your ideal clothing company. Think about the PR department of a major fashion brand: they get dozens – potentially hundreds – of pitches every day from bloggers or posters trying to work with them, by featuring their products in exchange for freebies, or credits. How are you going to make your pitch stand out? Fewer followers with a very high level of interaction and cross-participation will get you a lot further than having 15,000 followers with whom you rarely interact. If sales of a particular dress spiked after you featured it on your blog, or you’re regularly recommended by other fashion bloggers, demonstrate this. Know what you want from the collaboration before you begin your pitch, as well as what you’ll give them in return.